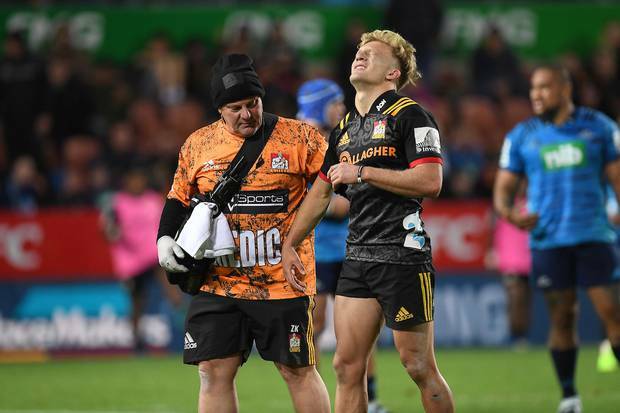 All Blacks star Damian McKenzie is set to miss the Rugby World Cup. All Blacks coach Steve Hansen has announced today that McKenzie ruptured his ACL on Saturday night, and is as a result is likely to be out of contention for rugby's pinnacle event in September. A ruptured ACL usually requires anywhere between six to nine months on the sideline, meaning McKenzie would need a miracle recovery if he was to be any chance of being on the All Blacks' plane to Japan. The Chiefs fullback limped from the Waikato Stadium pitch on Saturday night in his side's win over the Blues. He suffered the injury early in the second half when attempting a tackle on first-five Otere Black, and looked to be favouring his right knee when hobbling off. He walked from the field with the help of a Chiefs medic but appeared in pain, and went on to have an MRI scan to determine the extent of the injury. The news is a blow for the All Blacks, with McKenzie having developed into a fine utility player for Hansen's side, capable of covering at fullback and first-five eighth, and often providing a serious spark and X-Factor when brought off the bench. He was picked as one of the 41 players to attend today's All Blacks foundation day in Wellington, and was highly likely to be one of the three first-fives selected for the World Cup, along with Beauden Barrett and Richie Mo'unga. Now, it looks as if the All Blacks selectors will have to change their plans.